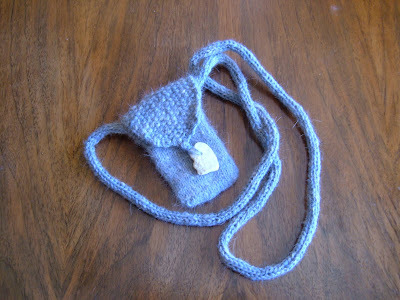 I finished the Lucy fiber project-a wee cell phone 'purse'. I am mailing it back to the blogger I won it from! 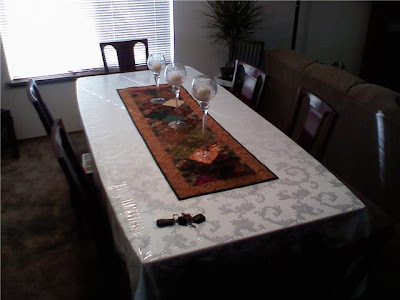 Jared and Krystle received their tablerunner and have it on their diningroom table! Thanks for the picture, it is nice to connect you guys! 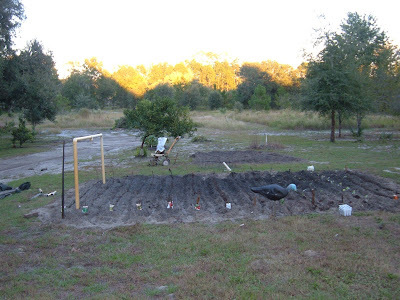 Bill has the garden all planted-this was a sunset shot--see how much of a 'hill' we have at our property! Well, it is for these parts! I finished a slipcover for an IKEA chair for a friend..........always up for a challenge, you know! 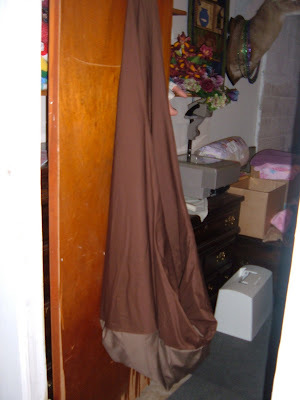 The chair has a cushion that slips in the bottom for shape and comfort-it looks a bit limp like this but will be a nice cocoon for her teenager now that it matches her room! 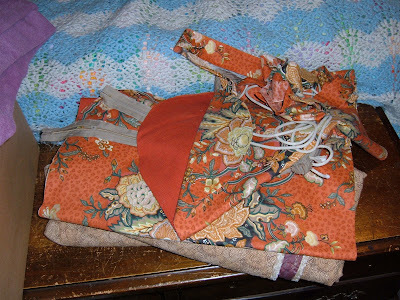 I got a bit adventurous after watching a Sewing with Nancy segment (304) and pulled out my embellisher machine and a piece of canvas and did a kind of crazy patch with fabrics and only a touch of wool. 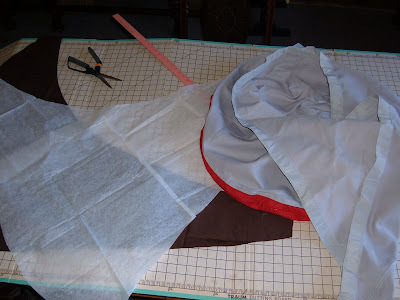 I have to do some free motion embroidery on it today , add some hot-fix crystals and it will be complete............well, I am going to back it and make it a pillow because it has to be useful--one of my problems with things artsy-what is it for?!!!! Give me time to grow into this new realm.......... 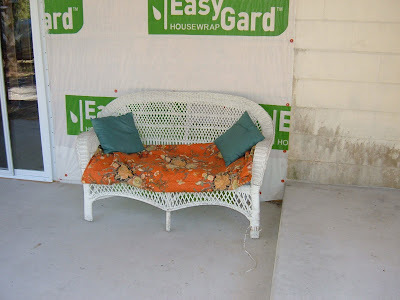 Working on the slipcovers for the wicker chairs today................hope to have them on the porch by this afternoon! 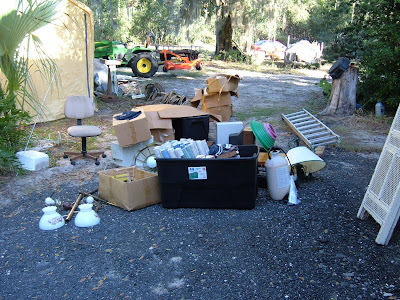 And then we will be organizing the 'treasures' we hauled out of storage for the community garage sale tomorrow! 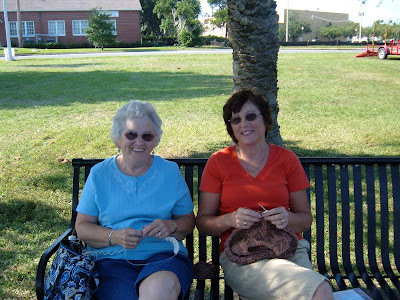 I will sit and spin/knit with my wares........hopefully Bill won't bring home too many new treasures! 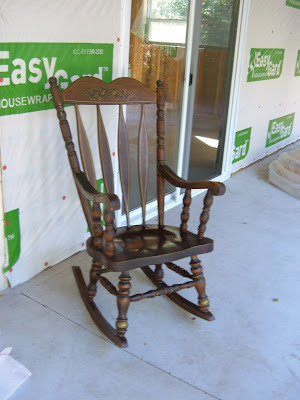 I found my rocking chair (purchased when pregnant for my second child who is now 28!) and did a bit of cleaning up-mold tries to claim anything in storage around here! 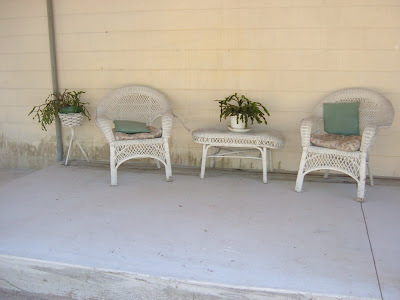 I am trying to decide to paint it or not; the darker wood will just have to grow on my or get lightened up. I do have enough of the wicker cushion fabric to make it match at least. Looking forward to a great day ahead-hope you are , too! It is good to rediscover home........cleaning chores are done, well, caught up for the moment and it was time to explore the yard. 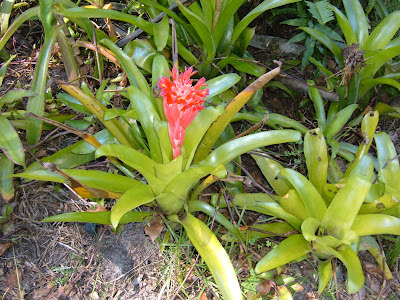 another bromeliad is in bloom. The temperatures have dipped a bit from before we left.....down in the 50's last night-and only in the mid 60's right now--good thing the weather at Marsel's prepared us. 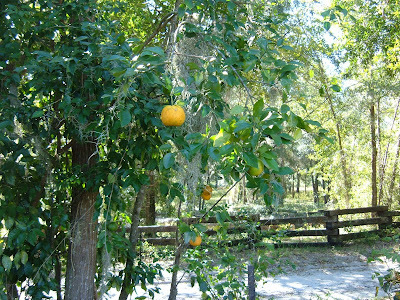 But when the temps dip, the oranges begin to ripen and turn orange! 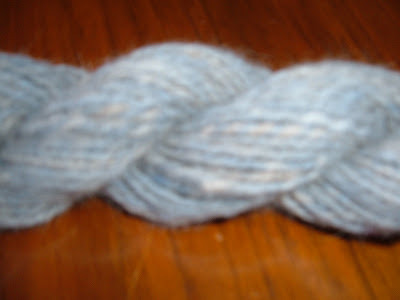 I finished spinning the Lucy fiber-the second pic is blurry but it is the true color so I have left it here. 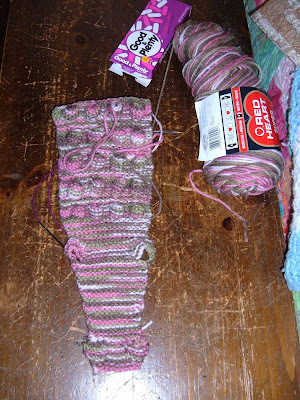 I am going to knit it up into one of my little original cell phone 'purse'. 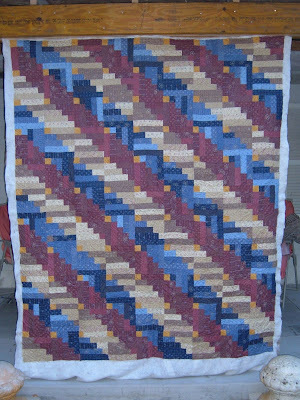 I mailed out the final Autumn tablerunner; this one was made with a charm pack instead of yardage. 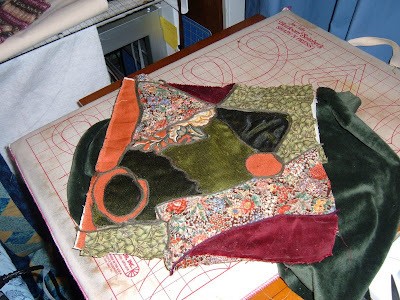 I sewed it at Marsel's but waited to quilt it here on the frame. Will definitely work on expanding this great design for other seasons-it was way too fun and yielded such great results. 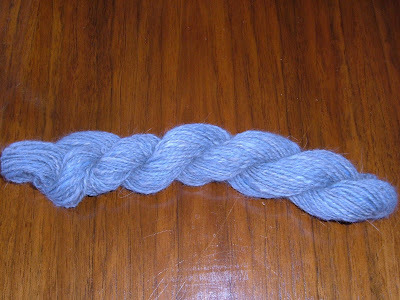 The suffolk wool is being blended with a recent purchase of alpaca-I am spinning up a sample and need to ply it to see how it turns out..........of course, the dye pot will be next cuz the color is too boring! 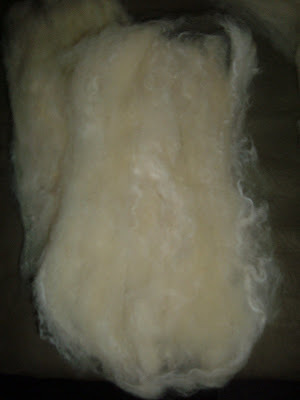 I haven't every dyed a batt but I am tempted to try as it is so plain while spinning. The girl gator scarf is growing! Sending a hug to my Mom for her birthday today! 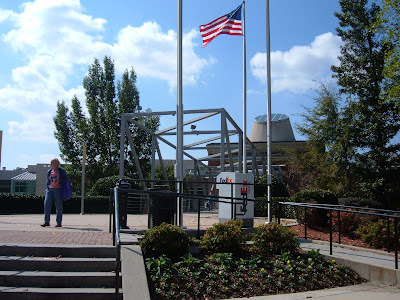 We are home again but oh, what fun we had in Georgia! 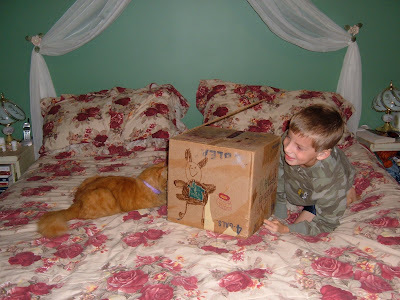 David and I learned how to 'trap' a wild animal -his imagination is beyond compare! 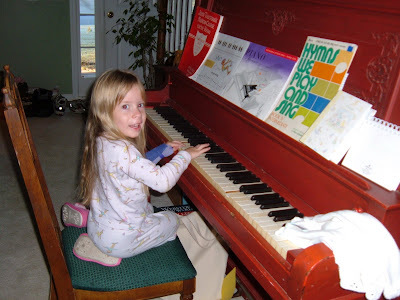 Abigail did a lot of this.......right in the middle of playing something else (or here as she just woke up), a song would have to be expressed on the piano! 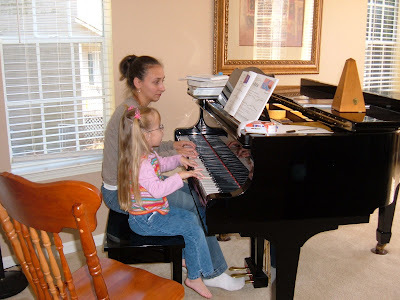 She is taking lessons; reading music already but also hears it in her head and picks out tunes all the time-since I am clueless on any instrument , this is a work of genius to me. 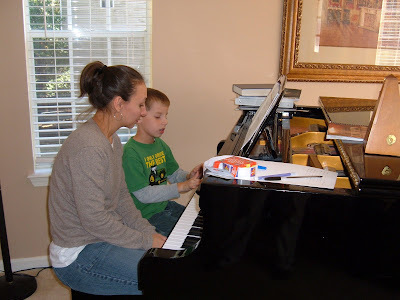 Abigail loves her weekly piano lessons........a hidden benefit is the physical therapy for that left hand-CP has impaired her mobility but her determination to play has paid off, thank you Lord for her strengths. ........and even tho he has to hold still, David has real musical ability, too! 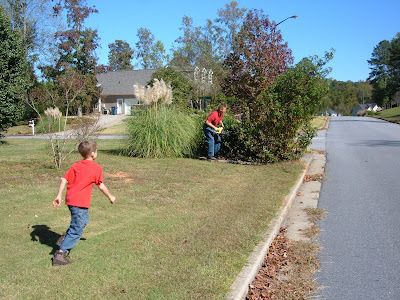 While Bill did a lot of this.......he and David were mostly outside working on the yard-removing unwanted holly bushes-nasty things! 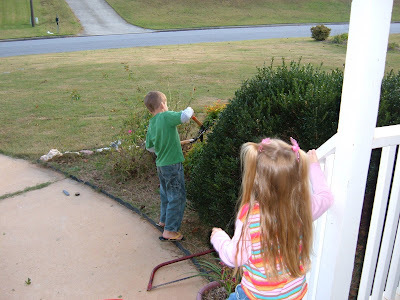 They also trimmed all the remaining bushes out front. 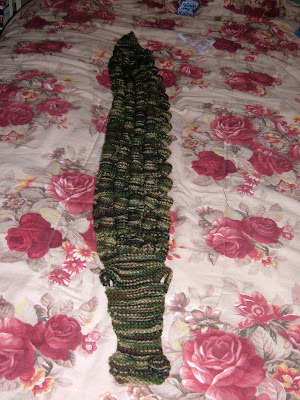 I finished David's alligator scarf........a new best friend. 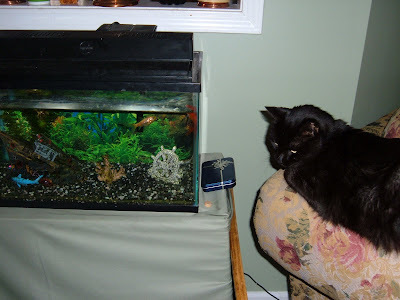 The cats did well with the trip; they do not get to go out while visiting but they do find catful things to do like laying on the quilt that you are working on , and reintroducing yourself to the aquarium residents. 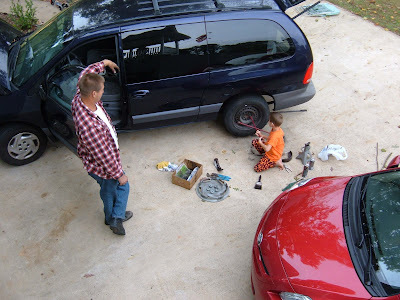 Bill and David worked on the van's brake system........it is the second generation of "push and let off now!" that Bill has trained! David loved every minute of it. 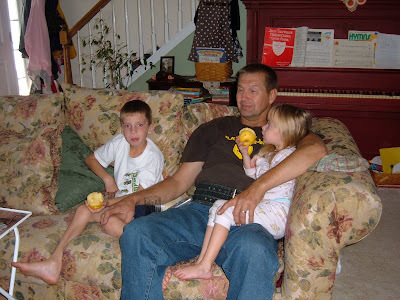 A good long visit and the fact that we will be seeing them again in a month sure softens the good-byes! PS-Bruce was at work while I did most of my picture taking, and then on a business trip but he was home long enough to get beat at Wahoo twice! 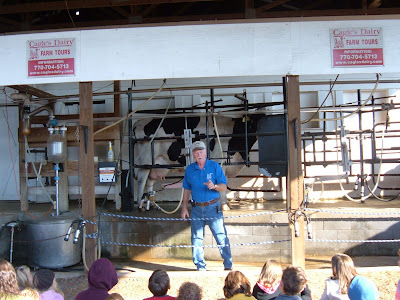 Tuesday morning we packed up and head out to Cagle's Dairy Farm for a tour. 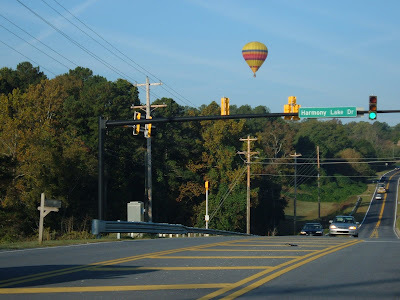 We saw this on the way. 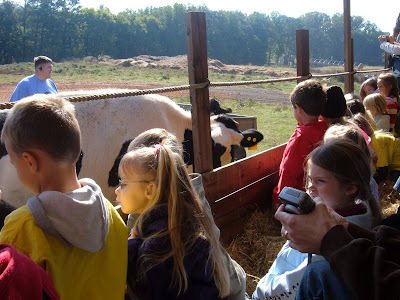 Right in the middle of encroaching suburbia, there is this farm-the last farm in the state of Georgia to raise their own calfs to milking cows, and then milking, bottling and selling their product. 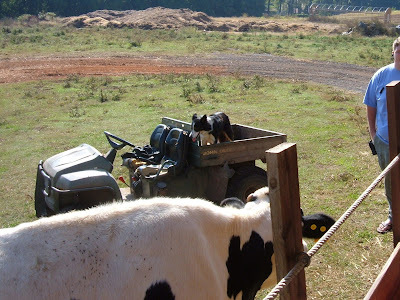 We enjoyed a hay ride, and watching their working dog, Tib, bring the cows in close for a feeding. 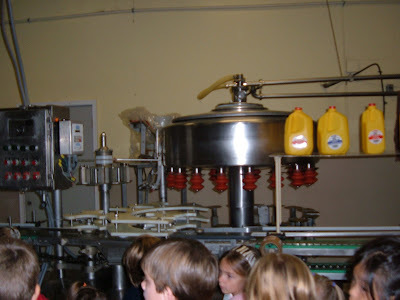 We enjoyed some chocolate milk at the end of our tour. 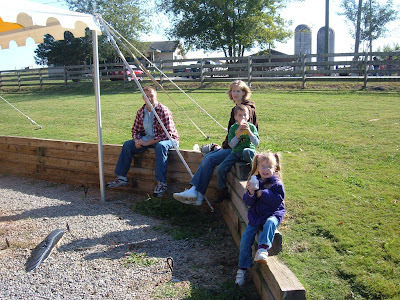 We are having a great time with the kids! Snuggles, books, games and imaginations abound. 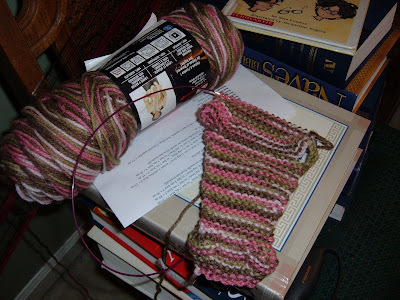 I am working on the alligator scarf for David...."Hurry up , Grandma!" and the sweater fit perfectly for Abigail. 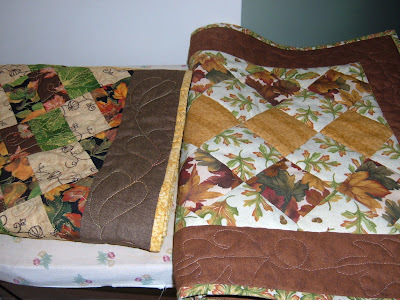 We found buttons yesterday at JoAnns Fabric Store after we enjoyed 4 hours at the quilt show at Gwinnett County Conference Center....oh, it was filled with beautiful quilts and delicious fabric vendors...........it was a wonderful time just my daughter and me! 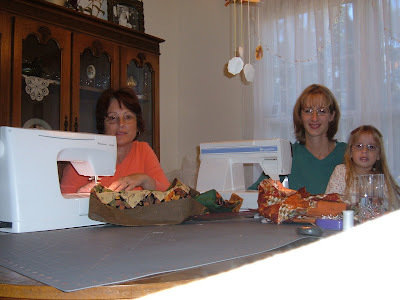 Church today and then lots of sewing tomorrow! My parents are on their way North; we had a wonderful visit! 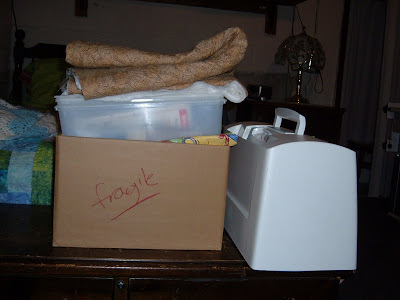 I am packing up for our own shorter trip North to visit daughter and family in Georgia! I have piles like this all around the house. 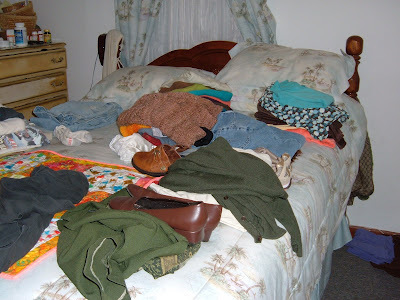 Sewing and knitting comes first and then if there is room enough; clothes! My priorities are straight after all. speaking of clothes, we do have to dig out long pants and long sleeves which we haven't worn since we were visiting her in April! Bill is closing up the yellow house where my parents stay. He has closed up our addition and mowed our lawns so we are all ready to head out tomorrow morning. 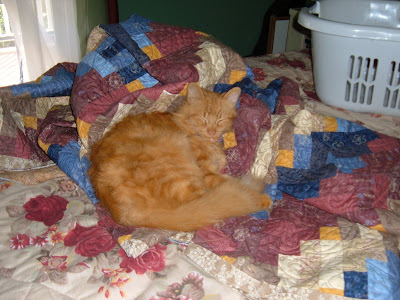 I finished quilting the American Heroes Quilt and have it in the pile to go so Marsel and I can sew the binding on it and send it out. 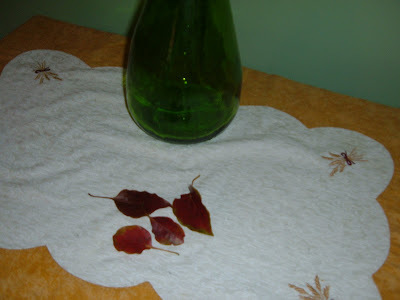 I did a bit of playing with some of the Lucy fiber I won on a blog drawing. She is a beauty of a cat, a sealpoint Ragdoll with bright blue eyes. 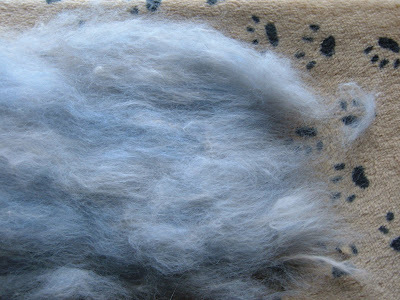 I picked some merinos in bluish grays to blend on the drumcarder with her fluff and have a delightful cloud of fiber to spin. 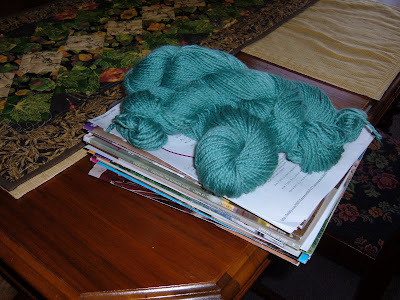 This will wait until after the trip to become yarn. Found these on the walk to the mailbox this morning.........the season is subtle but available to the watchful! I will keep you posted from Georgia where we are going to visit a Quilt show and a working dairy farm and fill up our grandparent tanks! 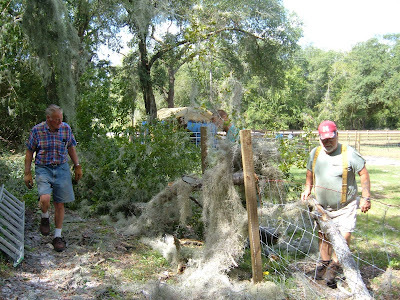 The day started out with our neighbor requesting we cut down a split-trunk tree that hangs over his fence and endangers his goats. 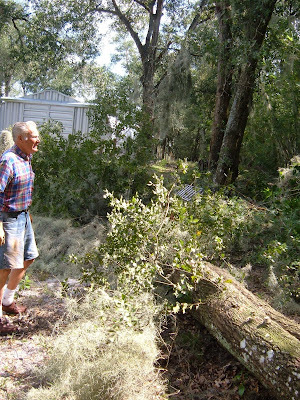 Dad and Bill head out with a chain saw , a rope and the tractor to cut it down. 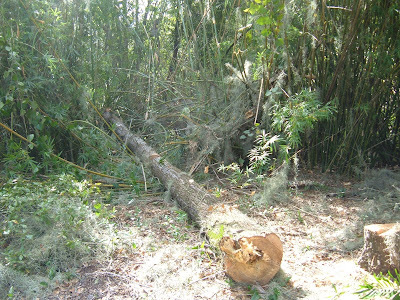 The first half of the tree falls away fromt he fence tho it knocks down our bamboo hedge. Dad makes a notch while Bill is on the other side of the hedge applying pull so it won't fall on the fence when it goes down. 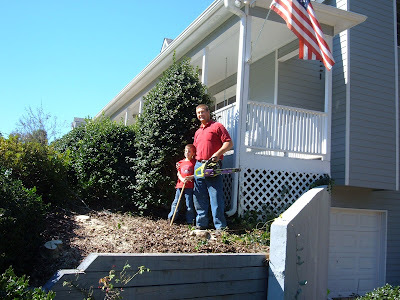 Dad calls out to Bill that it didn't work out as planned; the tree was rotten and as soon as they starting notching it , it went down! 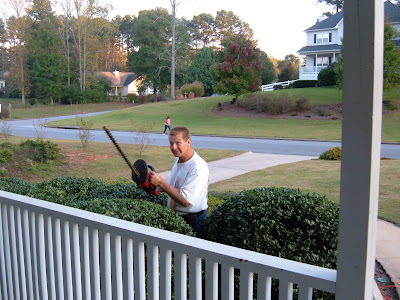 Our neighbor had been watching the procedure and he said, 'Well, it sure was an accident and not what you planned!" You think?!!!!!!!! 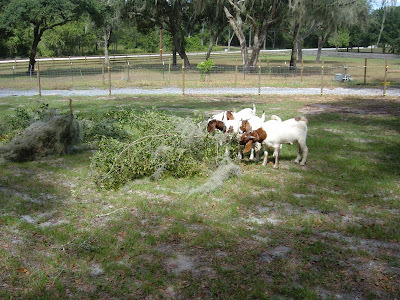 The goats were happy with the results and the branches kept them busy while the repair work took place! 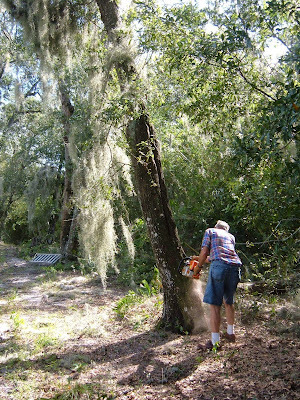 Bill and Dad decided that they are not going into business together cutting down trees! 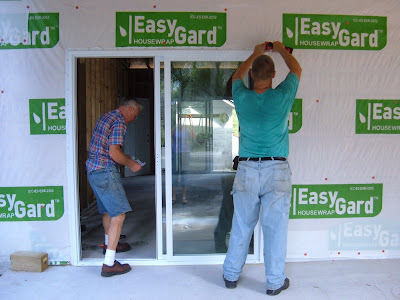 After lunch, they worked at a much safer job-putting in a sliding glass door! 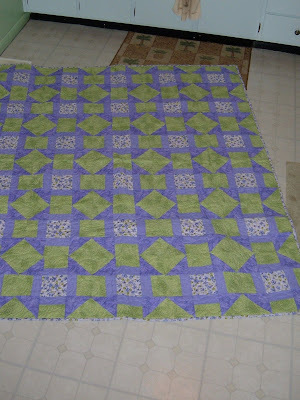 Mom finished the binding on her lime and violet garden gate quilt. It is beautiful! 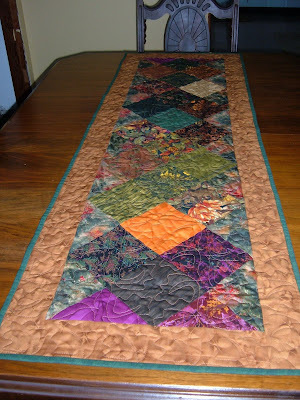 I think I have a lifetime job as her quilter now! 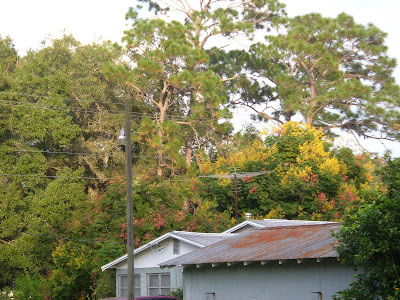 We don't have a panaroma of colored leaves here in Florida but we do have an incredible display of Golden Raintrees! They are everywhere and just breathtaking! 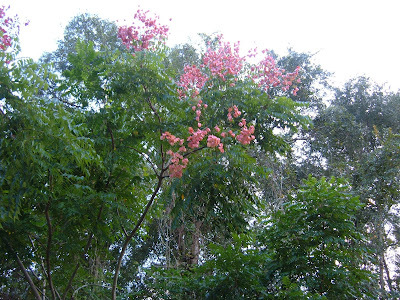 The first few weeks the trees are full of yellow blooms and then before the yellow is gone, rosy red pods form on the tips of the branches! 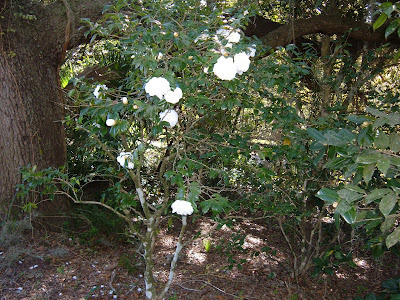 Young trees in full sun, get their blooms earlier than the young ones under their 'parents'. 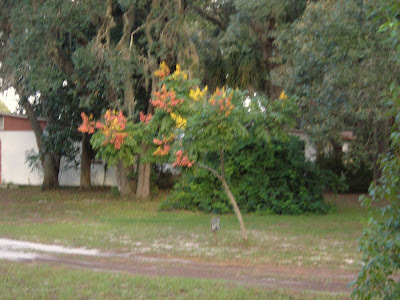 Sorry it is out of focus here.........but you get the idea. 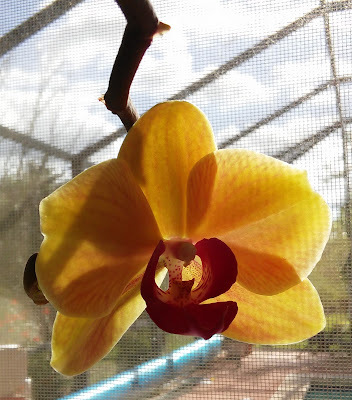 This one has lost its yellow and just the pods are left-it is still so pretty. 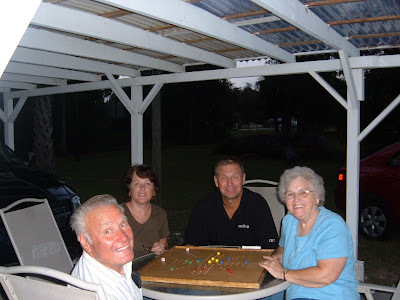 We played Wahoo under Mom and Dad's carport after they served up a great dinner. Ladies won 2 of 3 games for a change! 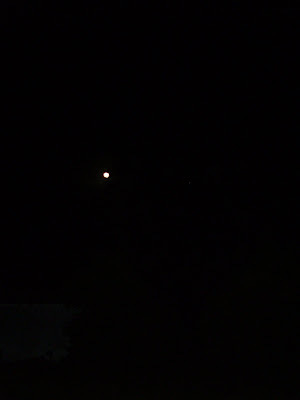 Full moon tonight.............was it full 516 years ago for Christopher Columbus' voyage?! Is Wrong Better than None?